SINMARA - New Track Premiere - "Crimson Stars"
Icelandic Black Metal titans SINMARA have revealed another song from their highly anticipated sophomore album "Hvísl Stjarnanna", to be released on 8th March 2019 through Ván Records. On "Hvísl Stjarnanna", SINMARA reveals a mournful and nostalgic atmosphere and soundscapes steeped in more grandeur than they’ve crafted to date, but yet showcasing serpentine harmonies permeated by the same malefic venom as has come to be expected of the band. TWISTED TOWER DIRE, formed in The Washington D.C. suburbs in the early 90’s, are finally back and will release their new album "Wars In The Unknown" on 15th March 2019 through No Remorse Records! Their ninth full-length "Beyond The Void", mixed and mastered by legendary producer Tue Madsen, will be released on 8th March 2019 via Crime Records. UK Metallers DETHONATOR have revealed a song from their new full-length "Race Against The Sun: Part One"! Following three years of writing and recording, Part One of DETHONATOR's new double album "Race Against The Sun" is finally out now. This is the band's most accomplished, colourful and tonally varied album to date! The digital release is available through Pavement Entertainment, the physical album will be sold via the band’s website (www.dethonator.com). "Melting the Ice in the Hearts of Men" is the fourth full-length of OUR SURVIVAL DEPENDS ON US. The unique quintet from Austria combines elements of classic metal genres with shoreless influences that words can barely describe. Belgian Black Metallers THRONUM VRONDOR are now streaming their new and third full-length "Ichor (The Rebellion)" in its entirety! "Ichor (The Rebellion)" perfectly illustrates the apocalyptic nature of THRONUM VRONDOR, founded in 2005 by Vrondor (guitars, bass) and Crygh (drums, vocals), with a desolate atmosphere and intensity. It was recorded, mixed and mastered by vocalist SvN and features an artwork concept and illustration by the band in cooperation with Chilean artist Daniel Valencia / Fenomeno Design (Blut Aus Nord, Demonical, Manes, etc). 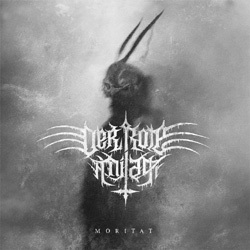 German Black Metallers DER ROTE MILAN are now streaming their new album "Moritat" in its entirety! The band’s second full-length will be officially released on February 1st 2019 via Unholy Conspiracy Deathwork. It was recorded, mixed and mastered by Markus Stock at Klangschmiede Studio E and deals with local stories based on real events during the Thirty Years' War. Coming in limited versions as a noble A5 Digipack-CD and on red vinyl. On January 25th 2019 War Anthem Records will release "La Senda De La Muerte", a split MCD featuring Colombian Death Metallers SOL DE SANGRE and Spanish Death-Thrashers PANICO AL MIEDO! Both have covered two songs of their favourite bands: while SOL DE SANGRE present Entombed's "Revel In Flesh" & Unleashed's "Before The Creation Of Time" (mixed by Tomas Skogsberg, mastered by Dan Swanö), PANICO AL MIEDO decided to pay their tribute to Death's “Pull The Plug” and Pestilence's "Twisted Truth" (mixed by Marc Boria, mastered by Tony Lindgren). Furthermore they decided to reinterpret the lyrics in their native language, giving the cover versions a completely new vibe and atmosphere. Lyric videos are available at the following locations. "Foretold Monuments Of Flesh", the duo’s debut album, will be released on 29th March 2019 on CD (limited, hand-numbered digipack), LP (limited silver vinyl & black vinyl) and in digital versions. Norwegian Black Metallers BLODHEMN have released another song from their upcoming new album "Mot Ein Evig Ruin". BLODHEMN's third full-length will be released on 15th February 2019 via Soulseller Records and was mixed by Øystein Brunn (BORKNAGAR) / Crosound Studios. Bandleader and sole (studio) member Invisus delivers 8 hymns of northern fire & ice - be prepared for exceptional black metal tunes with thrashing twists!